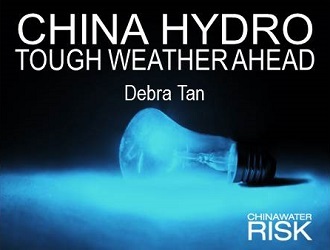 Southern China is getting drier; Debra expands on whether we should delay hydro expansion plans., Southern China is getting drier; Debra expands on whether we should delay hydro expansion plans., Southern China is getting drier; Debra expands on whether we should delay hydro expansion plans. Apparently it will be wetter in the North, thanks to a switch in the Pacific Decadal Oscillation (PDO) from a warm to a cool phase (more on this in Food, Weather & Water Heading North). The bad news is that this switch will make it drier in the South. The switch between phases happened in 2006 and since 2009, we saw droughts in water-rich Southern provinces like Yunnan, Guizhou and Sichuan. This year, it has spread to Hubei and Hunan and in 2011, the Three Gorges Dam suffered a loss in power generation capacity to relieve the drought. More recently, on 24 July, the State Flood Control & Drought Relief Headquarters announced that the drought plaguing parts of Hubei, Hunan and Guizhou are likely to continue and estimated that 832,000 hectares of agricultural land have been affected in these provinces. But what about hydropower? China as we all know is a very dammed country. The last official count per the 2012 Statistical Yearbook was 45,151 hydropower stations of which the Three Gorges Dam is but one. With the central government push for renewable energy, Beijing choking on bad air and now the possibility of not enough water to extract coal, hydro seems like a good idea to shore up energy security. 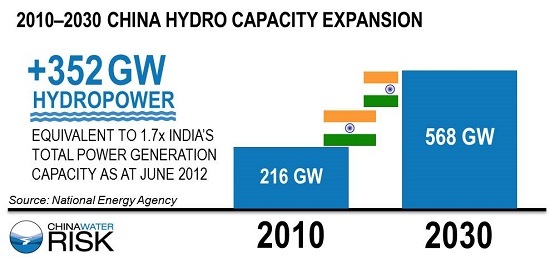 Indeed, the Chinese government plans to expand hydropower capacity from 216GW in 2010 to 568GW in 2030. This additional +352 GW of power is equivalent to 1.7x the current installed capacity for the whole of India as of June 2012. 2030 might seem far away but even the 12FYP, a closer target, is aggressive. The 12FYP expects hydro capacity to increase by 69GW to 285GW by 2015. The map below which we prepared for HSBC’s No Water, No Power report issued last year gives an idea of where the 12FYP expansion lies…. Additional hydro capacity in Yunnan and Sichuan where rivers form from Himalayan glacier run offs – there are eight dams which are under construction in the upper reaches of the Lancang section of the Mekong River. According to the 12FYP, around 80% of this additional 69GW of hydro capacity expansion will be located in Yunnan and Sichuan. Seems like a sound plan based on the last 50 years of weather patterns but given recent droughts in these provinces and forecasts by weather experts of drier conditions in the South, the viability of aggressive hydropower expansion in these two provinces comes into question. Nomadic experiences of water and weather high up in the mountains of Yunnan and Sichuan recounted by explorer and author Jeff Fuchs adds further concerns that the South is indeed experiencing a period of less water (read Jeff’s first-hand accounts here). So to dam or not to dam? In light of drier times ahead in the South, surely it is prudent to delay hydro expansion plans. At first glance, there appears to be little upside with sub-optimal hydropower generation and significant downside with a rise in geopolitical tensions with neighbouring countries. But then again, damming may not generate power but could provide relief in times of drought and ensure the safety of staples such as rice (75% of China’s rice production lies in the South). Either way, it’s not good to be downstream of China. Not only does China control the headwaters of the transboundary rivers with no water sharing treaties, those countries too lie in South Asia and are in for drier weather. 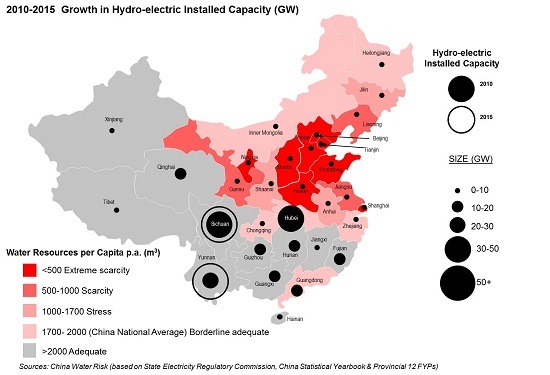 China: No Water, No Power: HSBC asks if China has enough water to fuel its power expansion as China plans to add more than the total installed power capacity of the US, UK & Australia by 2030. Climate Change & Hydro: Mutually Damming: With droughts affecting hydopower generation, is damming the best way forward? Katy Yan of International Rivers explains why China’s 12th FYP favors risky dams over climate resiliance. Geopolitical Risks: Transboundary Rivers:China owns headwaters to at least 10 major transboundary rivers but has no formal agreements with neighbours on these. Sophie le Clue explores increasing tensions in South and SE Asia.